We had another wonderful adoption today. After four months at the SPA Auguste found a new home today. Despite his name this lovely shepherd cross did not arrive in the month of August. He in fact got his name due to his resemblance to SPA resident Cesar. In fact there are many dogs who look a bit like this, and our hearts always sink when new ones arrive. Looking a bit unusual can definitely be a good thing at the SPA, when each dog is effectively competing for the attention of visitors. Auguste’s new family did in fact look at a couple of dogs of the same type, but they finally chose Auguste and we are delighted for him. We suspect that he was left behind when some travellers passed through the area, and he has not enjoyed being locked up. 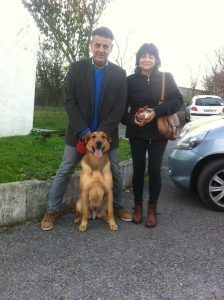 His new family promise lots of lovely walks and outdoor activity, and Auguste should have a great life with them. Tomorrow is December 1st, and that is Auguste’s third birthday, according to the vet’s estimate. What a great birthday present he has had. Other dogs are hoping that Christmas brings them joy, even if it is only in the form of a Christmas bauble! Although of course an adoption would be best of all! There were no arrivals…let’s hope this carries on. More dogs in the warm is what we all want.